HomeProducts & LaunchesRiot Eats: New Range of Plant-Based Dairy Alternatives from GreenSpace Brands Inc.
Riot Eats: New Range of Plant-Based Dairy Alternatives from GreenSpace Brands Inc.
A new plant-based milk brand is set to be launched in early 2019. 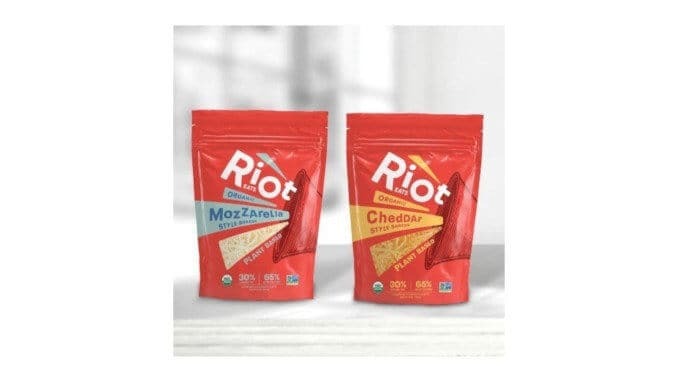 GreenSpace Brands has created the vegan brand Riot Eats, which features plant-based dairy products such as vegan cheese, butter and spreads. The brand was recently launched in the US and Canada at Natural Products Expo East and CHFA East, and has already been well received. The CEO of GreenSpace Brands, Matthew von Teichman, says, “Riot Eats™’s goal is to change the script about plant-based foods, from giving things up to having exciting personal experiences.” According to Teichmann, the new dairy alternatives, made with high-quality ingredients, are perfect for those who want to try something new and healthy. He continued, “The launch of Riot Eats™ is building on our mission to achieve more.” At the beginning of next year, the plant-based dairy products will be available in organic and conventional food stores.